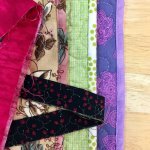 Learn how to sew binding onto your completed quilt projects. We will teach you two different methods for completing this final step in the quilting process. In class we will address how to decide how much binding you need, how to cut your binding, how to attach your binding to your quilt and how to finish binding. We will go over two different methods for completing your binding: the traditional and modern method. Bring your machine, accessories, and regular sewing supplies.